Dr. Taban was recognized as one of the top 10 students at Tehran University Medical School. When he was 18-years-old, he was accepted to Medical School in a class of 250 students, being selected from over 30,000 applicants based on a highly competitive national entry exam. He finished his surgical internship at Brown University affiliate medical centers in Providence, Rhode Island. He completed his residency in Neurosurgery – Spine Surgery at the prestigious NYU, Past Chief Resident in Neurosurgery, Bellevue Hospital Center and NYU and subsequently was a Neurosurgery Instructor at Kansas University Medical Center. He was licensed to practice in the State of New York and is currently licensed in the State of California. Two times Past Chief of Surgery, Northridge Hospital Medical Center. Director of Neuroscience since 1995. 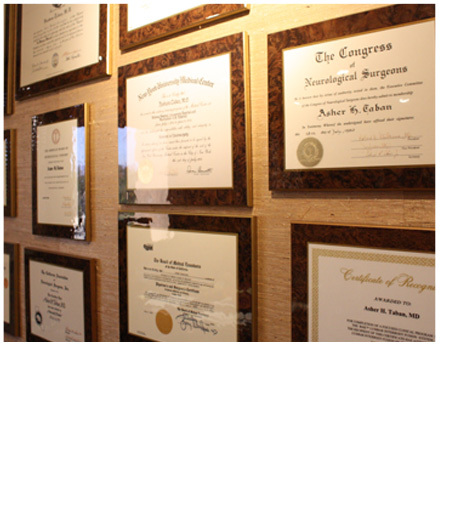 Dr. Taban stays current with his expertise by frequently attending national and international Neurosurgical and Spine Surgery conference and training programs.